Built-in functions make the Measure Master Pro ideal for faster, more accurate material estimates. Quickly solve Circumference, Circle Area, and Arcs. 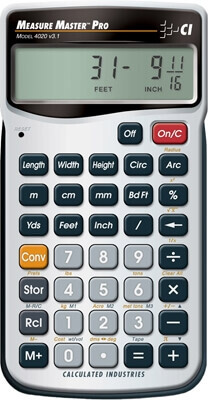 This simple and powerful calculator fits in a pocket, briefcase or tool pouch. Use it at home or in the shop for on-the-spot calculations - saving you time, money and frustration!